Enroll In the Next 24 Hours and Grab the Next Payday! Bryan Perry here, and I’ve sent you this special message to tell you about a little-known income investment my readers and I own that pays 8.92% annually in regular monthly installments. If you enroll in the next 24 hours, you’ll still catch the next monthly payout for owning it less than 30 days! In fact, my high net-worth readers who put $1 million in this fund will grab a $7,400 payout in less than 30 days. Those who invested in this little-known security when I recommended it March of last year have not only collected twelve $7,400 paydays for a total of $88,800, they are smiling all the way to the bank. And they’ll be collecting their own $951,912 payday along with Wells Fargo & Company, Bank of America, Morgan Stanley, and the Royal Bank of Canada. I don’t want to see you miss this. Join us today and I’ll give you almost 82% off, along with my subscriber-only write-up on this little-known income stock that will hand you a rich payout in less than 30 days! My Money Will Be Safe? Because this is where Wall Street’s most profitable hedge funds, mutual funds, and investment banks invest their cash to boost their total returns. And all they are doing — I repeat, all they are doing — is parking their money in this little-known income fund that pays you 8.92%, and laughing all the way to the bank! This is one reason why Bank of America’s profits have been shooting through the roof — by owning shares of this company! By simply enrolling in this fund, as I’ll show you in your free online report, you’ll finally be able to enjoy the same kind of fat payouts that hedge funds and institutional investors have enjoyed for years, and bank an easy 8.92%, too. If you act in the next 24 hours, you’ll lock-in your first monthly payout in less than 30 days. That’s because you’ll not only be getting over three times more money than a one-year CD, you’ll also know that your money will be equally as safe. This is why Wall Street’s biggest insiders are already in on this deal! Once you see how this fund can pay you this kind of high dividend safely, I know you’ll never put your money in a CD, Treasury bill, or low-paying dividend stock again. Be on the golf course by 3 o’clock every afternoon. Only this company make a whole lot more money on the spread. How? Talk about a Triple Crown winner! That, my friend, is precisely how they can pay you a rock solid 8.92% annual dividend, payable in monthly installments, with the next payout coming in less than 30 days. Surprisingly, it’s able to do this not by owning the market’s riskiest stocks, but by owning the market’s safest ones—financially solid companies whose incomes and cash flows are rising. I speak, for example, of solid companies like Bank of America, Wells Fargo & Company, Microchip Incorporated, Wright Medical Group, Herbalife Nutrition, Advanced Micro Devices, and many others. If you look at the chart below, you can see that Bank of America and Wells Fargo are double-dipping here. You see, not only does the fund own their shares… but the banks own shares as well. The reason is simple: So that they can grab this fat dividend yield too! After all, they’re making three times more in this income fund than they will pay you in a CD. That’s why the list of major investors on this one reads like a “Who’s Who” of Wall Street insiders, and why you’d be foolish not to take advantage of this little-known opportunity to bank an 8.92% annual payout for yourself. 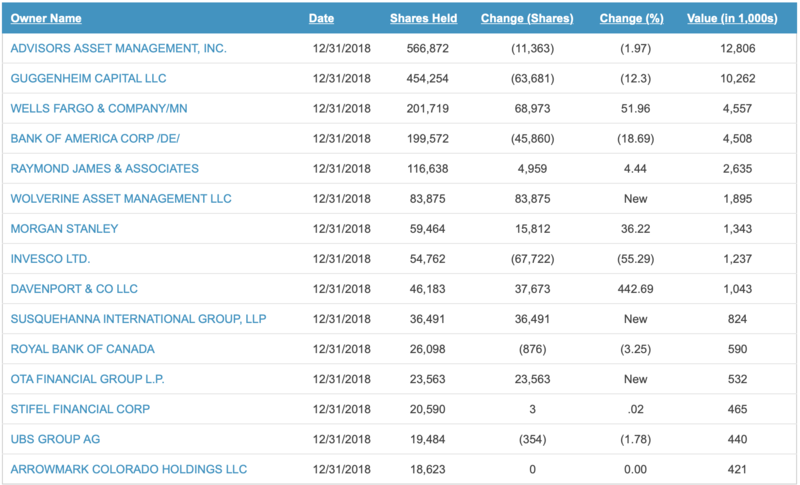 That’s why Advisors Asset Management owns 566,872 shares… why Guggenheim Capital LLC owns 454,254 shares… and many other BIG NAME Wall Street insiders are ALL IN in on this deal. 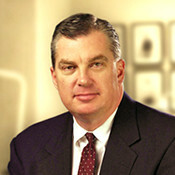 They know precisely how this dividend is earned, and they have millions invested, knowing their investments are secure. When you join them and enroll in this high-income fund, you, too, will collect an 8.92% annual dividend, just like a Wall Street insider, and sleep soundly at night while they do all the work. Those who enroll in the next 24 hours will automatically receive the next monthly payout in less than 30 days. That’s why I’m CUTTING THE COST of Cash Machine — for just the next 24 hours — so you don’t miss this opportunity. In fact, the average high-yielding investment in our Cash Machine portfolios pays a whopping 7.47% annual yield. That’s 3 times more money than a one-year Treasury note. That’s 3 times more money than a taxable money market fund. That’s 3 times more money than a five-year Treasury note. That’s 3 times more money than a 10-year Treasury note. That’s 2 times more money than a five-year CD. That’s 2 times more money than a one-year CD. All in the safest and highest-yielding income investments on the planet. The extra income they are earning is making a big difference in their lives… doubling, tripling and quadrupling their income over their current income investments. So, instead of earning $24,900 a year in a money market fund, or $33,700 in a five-year CD, my readers are collecting $74,700 a year in dividend income — not including capital gains. I don’t know about you, but that’s a lot of money to me. Especially when the only work on your part is shifting into these safe high-income plays from underperforming CDs, stocks and funds. This is why Cash Machine is one of the most respected advisories for income investors who want to boost their income without increasing their risk… and why I created Cash Machine in the first place. As you’ll see, by simply embracing the opportunities, you, too, can earn 6%, 9%, even as much as 11% annually, with the sleep-at-night safety you demand for your investments. That’s why you can add this 8.92% income play to your holdings in complete confidence. You’ll find more than a dozen higher-income opportunities to meet your needs. Most financial advisories often treat income investing as an afterthought, offering one or two income plays in the 5% to 6% range. But, at Cash Machine, we cover the entire universe of higher-yielding income opportunities, including preferred stocks, master limited partnerships, closed-end funds, convertible securities, hybrid financials and equity-linked securities — giving you dozens of opportunities to increase your income with the risk you feel comfortable with. Your money will be a whole lot safer, too. That’s because we specialize in one thing and one thing only: Investing safely in higher-yielding securities. As a result, we spend scores of man-hours researching each opportunity before we endorse it — and, with a ratings system that’s tougher than those of Moody’s, Dun & Bradstreet, Fitch Ratings and Standard & Poor’s, you get the sleep-at-night safety we demand from all our income investments. You’ll always get winning advice and reliable guidance for safely boosting your income. Since I’ve been publishing Cash Machine, I’m proud to say that my readers have been able to safely claim yields of up to 21%. As a new subscriber, you, too, can count on me for winning advice in selecting the right income investments for you. Your income could even double right away. How can it not? 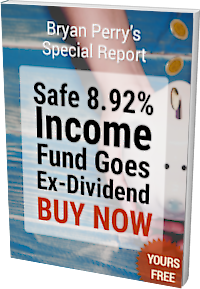 In your free report, Safe 8.92% Income Fund Goes Ex-Dividend: Buy Now, which you can download right now, I’ll give you the full details on this incredible opportunity. 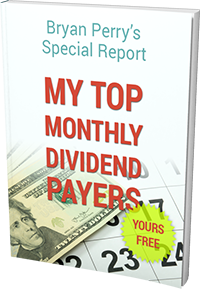 Plus, I’ll also send you this just published report to maximize your retirement income: My Top Monthly Dividend Payers for 2019. Together, your free reports will also lay the foundation for every income recommendation I will bring you in the months ahead… along with my philosophy of investing in financially solid income stocks with long histories of paying rising dividends. AND you’ve got a 100% money-back guarantee! You never have to take any risks! If you are not 100% satisfied with my service any time within the first 30 days, I will refund every penny you’ve paid — no questions asked. And the No. 1 choice for investors who are serious about safely boosting their income and rebuilding their wealth. Once you join us today, you’ll see why, and you’ll be well on your way to safely doubling, tripling and even quadrupling, your income. My special offer makes it easy, convenient and risk-free for you to get started. A one-year subscription is regularly $249. However, as part of the special introductory offer today, you can join me for just $49.95. That’s just 13 cents a day to discover how you can go from a 2% money market fund or 3% CD to safer and higher-yielding income alternatives that can pay you from 6% to 11% monthly, quarterly or semi-annually. And, because this fund has a long history of increasing payouts, we’ve made it possible for you to join us for two years at the low price of just $89 — a savings of $409 off the regular rate. That way you won’t miss a dime in payouts. 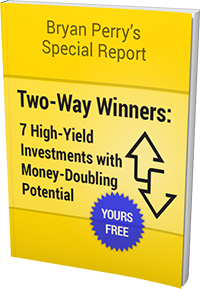 In the bargain, you’ll also receive all the benefits above plus an additional free report: Two-Way Winners: 7 High-Yield Investments with Money-Doubling Potential. Since both subscription offers come complete with our 100% money-back guarantee, why not consider the two-year trial? If at any time during the first 30 days, you don’t feel that Cash Machine delivers the safer, higher-yielding income you want, drop me a line. I will personally send you a full and complete refund of every single penny you paid. No matter which subscription term you choose, you keep all your free reports and all the issues of Cash Machine with my thanks for giving us a fair try. Naturally, I couldn’t offer you such a strong guarantee if I weren’t 100% certain that you would be thrilled with my service. Given the fact that we have one of the strongest renewal rates in the industry, there’s really no risk on my part, or yours! When you deliver, people stick with you. I’m convinced you will too. And you’ll begin to see how exciting it feels to see your income double, even triple, without risk. Remember, with my 100% money-back guarantee, you have nothing to risk and everything to gain. Join me now at Cash Machine and grab my top 8.92% dividend play today before it goes ex-dividend May 8. I guarantee it will be one of the smartest financial decisions you will make in your life — or you won’t pay a dime. This stock will go ex-dividend in a matter of days, and pays out a dividend every month to shareholders of record. Now is the time for you to get your part of the payout! My 30-day risk-free trial and money-back guarantee will allow you to grab one month’s worth of payouts before you decide if Cash Machine is right for you. If I’m right, joining me today will be your best financial decision of the year. If I’m wrong, you can cancel and get your money back. And it’s your decision all the way. Act now to lock in the next monthly payout with my 13¢ a day offer!